Compatible with x1, x4, x8 and x16 PCI-e slots! PoE power sourced from host system PSU via rear disc drive connector. OEMs can offer end-users a proprietary fully integrated PoE compatible solution. Offers a much cleaner installation without added cables, injectors & switches. Provides for a much simpler installation reducing service calls. Multiple Cards per system - ok! Scalability - Allows OEMs to offer customers an upgrade path for additional PoE ports. AEI Fault Tolerant Utility included at no charge! It's Not Just A Switch! PoE Advanced Power Management. Allows Service Providers to be responsive, rather than reactive to customer needs. Command Line Interface control of PoE ON/OFF/RESET functions... accomplished without rebooting the host system. Click Here * Patented or patent pending technology. AEI Intelligent Technologies' AEI-e410C is a flexible and high performance embedded Physical Layer switch providing four (4) exterior Fast Ethernet ports, plus an independent 1000Base-T internal Gigabit uplink to the host system's PCIe bus through the card edge connector. Installation is a snap. Users only install one Gigabit Ethernet device driver, which is plug and play in most operating systems; and supports a wide variety of architectures. The four Fast Ethernet ports are controlled independent of the PCIe Bus by an embedded switch IC, which has 5.6 Gbps of bandwidth to achieve wire-speed performance. Moreover, it operates independent of the host system. Subsequently, if the host system locks the Gigabit uplink port to the host will no longer function, however, the eight Fast Ethernet ports will continue to function normally and pass data among themselves like a normal switch so long as power/GND resides on the motherboard. The AEI-e410C is an ideal networking solution for multiport industrial and fault tolerant applications! This section only applies to Power over Ethernet (PoE) applications. By using Power over Ethernet, installers need only run a single CAT5 or CAT5E Ethernet cable that carries both power and data to each remote Power Device (IP Cameras, VoIP Phones, POS Terminals, wireless access points, IP based access control devices, etc. ), therefore decreasing installation costs. Onboard Power Conversation technology allows system integrators to plug the internal PC power supply cable (4-pin disc drive connector) directly to a mating connector on the rear of the AEI-e410C. This Onboard Power Conversion technology enables the controller to act as a PSE switch (Power Source Equipment). 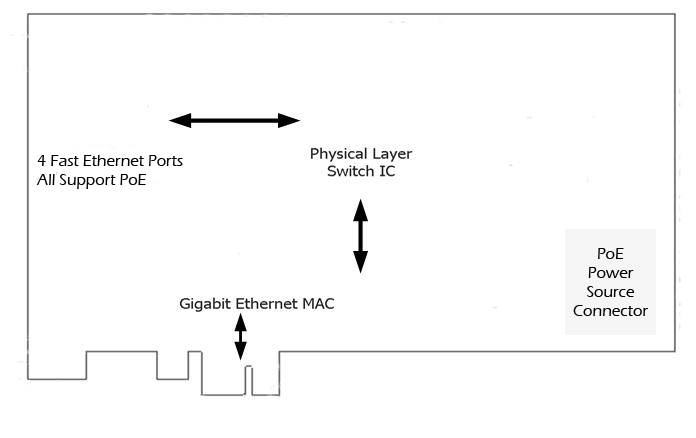 The 4 external Fast Ethernet ports are designed independently using IEEE standards for PoE (802.3af). Each port automatically senses if a PoE capable PD (Power Device) is attached. If the PD provides appropriate handshaking, onboard intelligence enables 48VDC power on the individual port. The adapter eliminates the need to run high voltage power 110-220VAC to remote PoE devices, and eliminates the need for standalone Midspan and Endspan PoE switches/injectors. The AEI-e410C-PoE sources it's "PoE power supply" internally from the system PC Power Supply (disc drive power connector). It incorporates "onboard" Power Conversion Technology™ that ramps up the 12VDC rail to the necessary PoE voltage. AEI-e410C. This utility is free with the purchase of an AEI-e410C. This software utility identifies cable and connection faults, network faults, as well as Power Device faults; notifies the user of the fault; and attempts to take correction action to cure the fault. This software utility resides on the Host System (NVR, or other PoE server). The utility monitors various wired or wireless network connections between the Host System and any network attached devices. This includes, but is not limited to other computers, routers, IP cameras (or other IP Power Devices). Users simply configure the utility to monitor up to 126 different "devices" (wired and wireless) in the software's configuration screen. When a network fault is detected on one or more of the monitored devices, the utility will attempt to re-establish the network connection two more times. If still unable to re-establish a network connection the utility will attempt to correct the fault by cycling PoE power (ON-OFF-ON), and subsequently restarting all PoE attached devices including PoE network equipment (routers), and other PoE Power Devices such as IP Cameras, POS Terminals, etc. In the event a device is locked-up, restarting it will usually cure the fault. Additionally, when a network fault is detected an ALERT will be sent. A pop-up window will be displayed on the Host System identifying the fault and what device(s) are reporting the fault. The utility can also be configured to send an email ALERT messages to multiple recipients. After cycling PoE power and resetting all Power Devices, the software will wait 5 minutes to allow all devices to re-establish network connectivity. The utility will then attempt to re-establish a network connection with the prior faulty device(s). If the device is able to establish a network connection , an "all good" ALERT message will be sent via a pop-up window and/or email. If the network fault has not been resolved, a final "fatal error" ALERT message will be sent. If the user wants a warning message sent without cycling power on all the power Devices... this can be accomplished in the utility configuration screen, or simply do not install the header cable between the motherboard and the AEI-e410C. ON-OFF-ON, and subsequently reset all Power Devices, without re-booting the Host System. This feature allows users with Remote Access privileges to the network to simply and easily reset all PoE Power Devices and PoE network equipment (routers, etc.) connected to the AEI-e410C. Additional information about the AEI Fault Tolerant Utility is available by clicking here. This is an optional jumper setting on the AEI-e410C Intelligent Power Conversion Card, and not recommended or necessary when the PoE Fault Tolerant Utility is running. When this jumper is installed, PoE power is cycled ON-OFF-ON for 2-5 seconds every 24 hours of continuous operation. This fault tolerant feature ensures that all Power Devices and PoE network equipment (routers) are re-booted regularly to ensure no prolonged faults. Through a factory firmware upgrade, the wait period between automatic restarts can be increased or decreased to any amount of time, days, weeks, months, etc. The AEI-e410C Intelligent Power Conversion Card includes a two-pin header for a manual switch in the event an OEM wishes to put a PoE Power Reset switch on their enclosure (SPST Momentary). This will allow users to reset PoE Power, and subsequently all attached PoE devices without having to re-boot the Host System. 4-Port Quad Fast Ethernet Controller with 1-Port Gigabit Uplink to PCIe Bus. AEI-e410C with PoE Circuitry Installed. Connector RJ-45 (f) Quad Gang Connector. Auto-negotiation between Full duplex and simplex operations AND between 10 Mbps and 100 Mbps. Gigabit uplink operates at Full Duplex. See the following hyperlink for downloadable device drivers, Diagnostic, and Management Applications. VxWorks. Wind River offers the drivers embedded in their operating system. Please, contact Wind River to confirm, and for any questions and support. See table above for further details. See Application Note AP001 for further information. * According to Telcordia SR-332 Issue 1 Environmental condition – GB (Ground, Fixed, Controlled). Ambient temperature - 25°C. Temperature rise of 10°C above the system ambient temperature was assumed for the cards components.